The Meso and Native American three sisters – squash, beans and corn – are not only one of the best examples of companion planting (see my previous post), but also make an amazing nutritional bundle; carbs, fibre, vitamins and the powerful protein complementation of the grain/legume combo are all amongst the many strengths of these three gifts from Nature. In Mexico, zucchini are used in many recipes, from ritzy stuffed baby zucchini, to simply stewing them in tomato sauce; the latter is not only a popular way to cook zucchini, but when its sisters are added – in the form of green beans and corn kernels – the dish becomes a complete meal. Note: Traditionally, the base for stewed zucchini is prepared by frying and then simmering chopped onions, hot peppers and tomatoes; I personally do not care for the texture of the tomato pieces at the end of that process so, for my dish, I chose smooth tomato paste instead, which may be added later. This presentation almost looks like a Mexican flag, and it would be my choice to please my family’s diverse tastes, from vegan/vegetarian to meat-lover daughters, and my husband, who is not fond of zucchini, but in his words, “the chorizo made the dish tolerable” (he even had seconds, ha!) For me, as long as the texture of the sauce is smooth, and the zucchini are not overcooked, I like any and all versions. This dish is probably best prepared in late summer, when the weather is not too hot, and the three sisters are available fresh from the garden or a local market. However, supermarket zucchini, and frozen corn and green beans are a good alternative for a winter craving. The fresh sprouts provide an extra crunchy bite; in my next post, I will talk about how I lighten the baggage of the “impatient gardener’s winter blues” by sprouting seeds indoors. This is a great recipe to cook any day of the week, so I am also sharing it at What’s for Dinner? 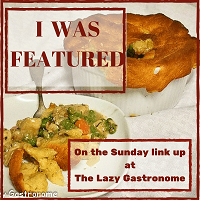 Sunday Link-up # 187, graciously hosted by Helen @ The Lazy Gastronome. And thank you so much to Helen for featuring my Atole recipes at this party! And Mary @ Cactus Catz is once again hosting her Tummy Tuesday, so I am bringing my super healthy recipe over. Yum! Thanks for all the beautiful photos, they make me believe I can make this! Very easy and so nutritious; I hope you try it Victoria! This looks great. I’ll have to find a source for Mexican cheese in the Netherlands. If you can’t, a light feta cheese will do, or a young paneer might work, as well. Thank you for your comment, Stefan! Excellent post. I have an allotment and have heard of the three sisters companion planting system, so I may just have to give it a go. 🙂 I may try out the recipe too. That sounds great, Kristian! My previous post talks about the gardening part, and has a link to the Farmer’s Almanac for planting directions. One crucial point for success is that the corn stalks must have enough cross pollination, so you would need at least 6-8 stalks in a block, not a single row. All the best! I love anything with corn and I might go crazy and add more. 😀 I love adding feta cheese as well. Thanks for sharing this lovely dish at this week’s Fiesta Friday. Thank you for your kind comment and for hosting, Jhuls! Irene – like this mexican dish – learning. It looks delicious. Sometimes I eat a tossed salad of cucumber, seaweed and corn. I’ve never used beans in my salad but you’ve given me an idea! And I have never used corn in my cucumber and seaweed salad, so you have given me an idea as well! Sounds yum. Will give it a try and let you know. Thank you so much, Punam, looking forward to reading your review! Oh Irene – this looks amazing!! Pinned! Thanks for sharing at the What’s for Dinner party. Have a great week. Thank you so much, Helen, have a great week, too! So glad you liked it; thank you for the feedback, Punam!